Bryophyllum pinnatum, also known as Miracle Leaf, Katakataka, Life Plant and Pashan Bheda / Patharchur, is a succulent perennial herb, which grows up to 1m- 2m in height. The plant grows in tropical, sub-tropical and warm temperate climatic zone. The stems are thick, flexible and short and the flowers are pink, white or purple in colour. It forms a cymose panicle. Dried carrot like tuberous root is most important part of Patharchur. This is a branched aromatic herb. The nodes are often hairy in some species. It is grown in the garden for ornamental purposes. 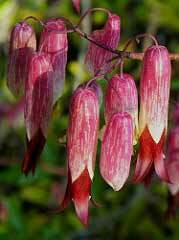 In India, this is found in Himalayas, Kashmir and Khasi Hills of Assam. It is also found in Pakistan, Nepal, Egypt, Brazil, Arabia, Myanmar, Africa, Thailand, India, Central and East Asia. Nowadays, the plant is cultivated in Andhra, Karnataka, Tamil Nadu and Kerala in large scale and sold to pharmaceutical companies. It grows up well in slopes of the dry hill. It also grows in Indian plains. The rhizome of this plant can be used as a preventive of the kidney stone or for the treatment of this. Tubers in India are eaten as a condiment. Bryophyllum pinnatum is given for the treatment of a cough, asthma, cold with candy sugar. It is used against dysentery. The plant root is used to treat high blood pressure. It is also used to prevent any kind of cardiac problem. Bryophyllum pinnatum is used for the treatment of fever. Rhizome powdered is used for the treatment of constipation. Bryophyllum pinnatum paste is used for the treatment of boil, wound, soar or cuts. The extract of Bryophyllum pinnatum is used for the treatment of roundworms. The extract of the plant is used for the treatment antipyretic activity. The paste of Pashan Bheda mixed with honey is used for the beginners teething trouble. Because of anti-diabetic property, it is used for the treatment of diabetics. The root of this plant is believed to protect the liver and proved useful for the treatment of hepatitis. It is proved diuretic. So, it cures difficult urination. Because of its antioxidant property, the plant is used in the mixture of herbal green tea. It is used as one of home remedies for piles (Hemorrhoids). The leaf juice is used for the treatment of stomach ache. The extract is used for the nourishment of the hair and treating gray hair. The leaves are used against intestinal disorder. The extract of this is anti-inflammatory and reduces inflammation. It is also used for the treatment of blood mixed diarrhoea. The paste is used against leucorrhoea. The fresh juice of Patharchur can be used to treat jaundice. It has importance in the treatment of certain types of cancer and weight management. It is the natural treatment for kidney and gallbladder stones.